Since I’ve had babies I’ve wanted to build traditions around Christmas. I’ve dreamed about the sense of holy wonder in our home as we contemplate together the rough stable, those young parents, the scrappy shepherds, the choirs of angels. I’ve wanted a Christmas build up that has felt like Christ-mas. God with us. It seems that little kids are offered all sorts of tinsly, glowing, baubly bits but there hasn’t been much for wondering on. So I wrote a book for families with children who are aged 3-7 years old. 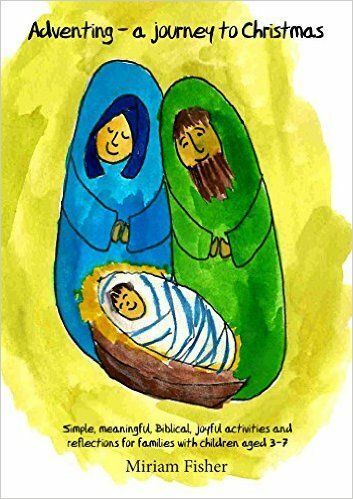 A book where each day is based on a word like – chosen, generous, myrrh and each day includes a Bible verse and a very simple activity and a reflection and a prayer. A book where the information is sound and meaningful. A book where the activities are actually achievable. A book that works when you miss some days because the grandparents came to stay and the cat vomited on the carpet and we all had a meltdown. I wrote this book for every family that’s wanted something more than tinsel and jingle bells. I wrote it for busy parents who want to do something well but don’t have time to do all the thinking. I wrote it for children, my children, and for so many little ones who are very dear to me and to whom I want to give the gift of wonder, delight, depth and meaning. This book is currently free as a kindle e-book, just for a few days. Then it will be about the price of a good hot chocolate. When I pray for this book I pray it will bless you. I pray it will encourage you and I pray that you will find it practical, Biblical and tradition building. Written by teacher, speaker and communicator Miriam Fisher. Motivated by a desire to provide theologically sound, simple, and meaningful ways to celebrate and anticipate Christmas together. This is my Christmas gift to you. Wrapped in my love for the honour and glory of Jesus. This entry was posted in Advent, christmas, family and faith, joy and tagged Advent, children, Christmas, devotional, ebook, family. Bookmark the permalink. Thank you! I’ve just gone to look at it on my Kindle and it says it’s not compatible for the device. Have you had anyone else have this problem?